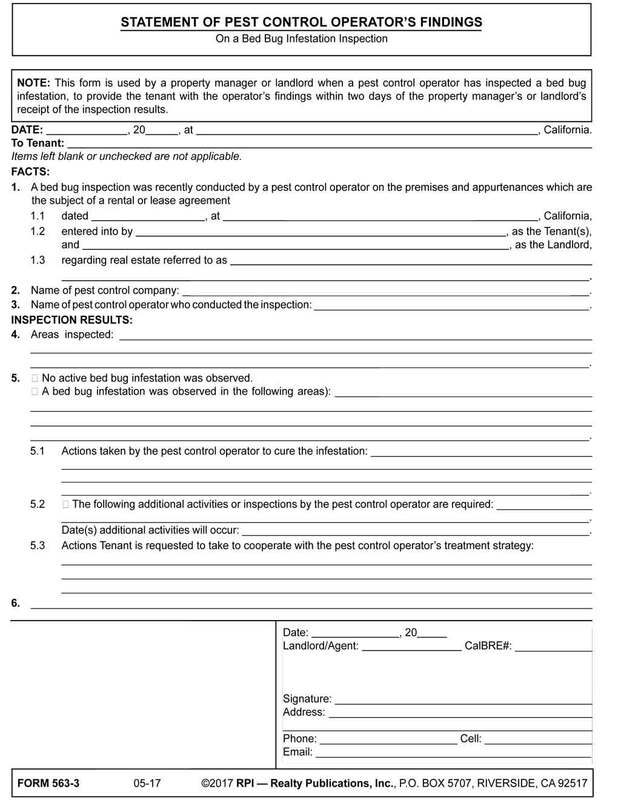 This form is used by a property manager or landlord when a pest control operator has inspected a bed bug infestation, to provide the tenant with the operator’s findings within two days of the property manager’s or landlord’s receipt of the inspection results. Bed bugs pose a particularly nefarious problem for California residential landlords. Bed bugs easily travel to neighboring units through articles of worn clothing, laundry, furniture or other forms of contact. In multi-family properties, infestations frequently affect areas beyond the control of an individual tenant. Thus, a bed bug infestation can be cataclysmic for a rental property — unless a properly coordinated and timely intervention prevents the contagion from getting out of control. The roles and responsibilities of landlords, tenants and pest control operators for the prevention and removal of bed bug infestations in residential rental property was recently clarified by new bed bug laws. Like all tenant-landlord relationships, the bud bug interaction is managed by written notices. A residential tenant under a rental or lease agreement holds ownership of a leasehold right to occupy the leased premises for a specific period of time. a residential tenant, especially an apartment dweller, is not just acquiring an interest in real estate by contract — they are entitled to the implied warranty of a safe and sanitary place to live, called a habitable dwelling. The bed bug notice advises tenants to cooperate in the prevention and treatment of bed bugs. It also notes the tenant is to promptly hand their written notice of a suspected bed bug infestation to the landlord or property manager. When a tenant reports a suspected infestation, the landlord or property manager will promptly contact a structural pest control operator requesting they investigate and correct the reported infestation. The landlord has a duty to select a pest control operator who has knowledge and experience in current best practices for bed bug management, such as those created by the National Pest Management Association (NPMA). destroying any untreatable items identified by the pest control operator. When a landlord has no notice or suspicion of a bed bug infestation, they need not call for an inspection of a dwelling unit or common areas for bed bugs. However, when a bed bug infestation is visually detectable during any landlord inspection, the landlord is deemed to be on constructive notice of the infestation. Further, a landlord may not show a prospective tenant any residential rental unit the landlord knows is infested by bed bugs. When a tenant gives notice of a suspected bedbug infestation, limitations are imposed on modifications of the tenancy by the landlord. Actions by a residential landlord to increase rent, decrease tenant services or evict are considered retaliatory acts if initiated by the landlord after a tenant complains to the landlord or a government agency regarding the habitability of the premises. However, this bar against enforcement does not apply if the tenant fails to timely pay the previously agreed-to rent. Statutory information about bed bug identification, behavior and biology is in the addendum to help the tenant correctly identify whether bed bugs exist. Form navigation page published 07-2017.